AGS Four Winds Thailand sponsored a two-piano recital with world-renowned pianist, Vladimir Ashkenazy and his son Vovka, who performed in front of a vibrant audience in Bangkok, Thailand. 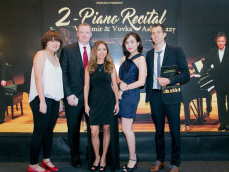 AGS Movers Thailand sponsored a two-piano recital with world-renowned pianist, Vladimir Ashkenazy and his son Vovka, who performed in front of a vibrant audience in Bangkok, Thailand. This once in a lifetime event took place on Saturday, 14 May at the Thailand Cultural Center and attracted classical music lovers from all over the country. An industry legend, 79-year old Ashkenazy senior has reduced his public performances over recent years, and hasn’t visited Thailand in decades. When AGS Group Chairman, Alain Taïeb heard of Ashkenazy’s anticipated performance in Bangkok, he immediately agreed to get involved. The vibrant classical music scene in Bangkok has expanded progressively, attracting both expat and young enthusiasts. In partnership with the Bangkok Symphony Orchestra (BGO) and TAYS Musical, AGS Movers Thailand was a key driver in the promotion of the concert especially amongst French expatriates. It was the first time that AGS Movers Thailand sponsored an event of this calibre and, due to its involvement, the branch was able to offer its dedicated clients complimentary tickets to the event. The memorable evening will remain etched into the minds of the entire AGS Movers Thailand team and its clients.